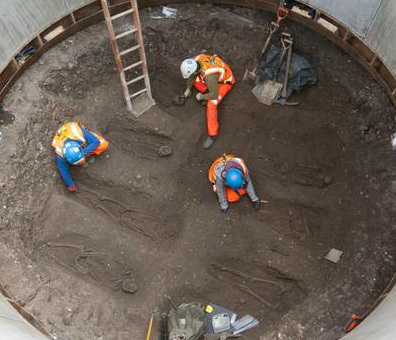 The discovery this week of a mass grave pit in London is a reminder that the Wolverton area was just as badly affected as everywhere else. This bubonic plague, against which few had immunity, reached Europe in 1348 and England a year later. As much as 40% of the population was wiped out and only the remotest places were free from it. Once is reached English ports on the south coast in 1349 the disease spread rapidly. There is no reason to suppose that Wolverton escaped the affliction. There is little of record but we can draw inferences from those records we do have. Bradwell Priory lost high numbers of monks and was barely able to function for a number of years after after 1349. The Prior himself, William de Loughton, died and the fortunes of the Priory, never very well endowed, did not recover. Later they had to seek Papal dispensation to allow illegitimately born children to become monks, even Prior – something that would not have been countenanced before the plague. Sir John de Wolverton, the last adult male in the de Wolverton line, died in 1349. His only surviving son died two years later at the age of 4. The dates invite us to make a connection with the great plague. Medieval men and women were accustomed to living with disease and death and developed a fatalistic approach to life to arm themselves against the unexpected. Nobody however could have been quite prepared for the great plague that was to spread across Europe in the middle of the century. In 1347 the first outbreaks of this new pestilence reached the eastern Mediterranean causing symptoms that would become familiar to western Europeans two years later – black swelling bubes on the skin, coughing blood and pneumonic infection and inevitable death. It was also highly infectious. By October 1347 a Genoese merchant ship pulled into Messina harbour full of sick and dying men. Other Italian ports were also vulnerable and nothing could be done to stop its spread. Wolverton would have been unaware of it at this stage, and even after it spread to France in 1348 most Englishmen, who were at war with France at the time, were complacent, seeing it as God’s vengeance on the French. Later that year, they could not avoid their fate because by the autumn the plague with all its awful symptoms and inevitable consequences had reached England’s shores. The ports and London were immediately vulnerable but nowhere was safe, and one must conclude that it hit Wolverton with equal force, particularly as the Watling Street was a well travelled road. These plague years were economically significant. The high mortality rate left behind a considerably depleted workforce and the old rules could not apply. Wages had to increase; service was only given for pay, rather than for the right to till a few acres of the lord’s land. Goods and services therefore cost more and there was economic inflation. This may have impacted more upon the lord, who had more need for goods and services, than the average peasant but even so it brought about a sea change in society. Merchants were able to make more money. Artisans were able to charge more for their products and services and were able to improve their quality of life. The rulers were alarmed at this uppityness and Edward III felt compelled to pass laws to bar people of lower ranks from wearing fine clothes. It made no difference as it was a law that was unenforceable. It was a period of rising prosperity for those who had survived the plague and like many periods of rising prosperity there were those who began to notice that the very rich continued to enjoy their riches while the less well off were struggling. Only four years into the reign of the young Richard II there was a flash uprising. As noted above, John de Wolverton died in 1349 and his son Ralph followed him. The daughters appear to have been survivors and possibly they were among those who had a strain of immunity to the disease. Quite possibly they did. At any rate it was probably the plague that brought the direct male line from Manno the Breton to an end and it was one of the female heirs marrying into the de Longueville family of Little Billing that was to shape the lordship of Wolverton for the next 300 years. The plague was not a one-off; there were recurrences in the years immediately after 1349, and further devastating outbreaks in 1360-62, 1369 and 1375. The influence was profound. William Grik of Stony Stratford, chaplain grants and confirms to Roger Grocone of Calverton A MESSUAGE in Stony Stratford in the parish of Calverton between messuage of Henry Anketil and that once of Hugh Turnus & 10 acres arable at Calverton and 1 acre meadow in le Mulueholm. William’s brother Thomas had held all those properties. We may deduce that Thomas Grik died in that year of the plague and possibly all of his direct heirs. Alice, Elizabeth and Isabella Dikoun, daughters and heir of Elyas Dikoun release to John de Broughton and Eleanor his wife all their right and claim in lands, tenements and messuages in Wolverton next Stony Stratford which they had after the death of their father. These are some examples of how society was changing. In earlier centuries there were a small number of transactions either between the lord and his tenants or with a certain amount of hands-on involvement by the lord. The services were often specific. Here, and in other documents of the period, the reference to services has become formulaic and unspecified. It is probable that the services were acquitted on the basis of some agreed payment. Population estimates for Wolverton are complicated by the growth of Stony Stratford, which also had buildings on the Calverton side of the street. In the prime years of the coaching trade in the early 19th century the town had a population of about 1,500. The 14th century may have accommodated 3 to 400, although this is pure guesswork. But let us assume that, as discussed earlier, the manorial population doubled from 1086 to about 500 in 1349. A further 2 or 300 may have been making a living on the Wolverton side of Watling Street, giving a total population of about 800. A 40% reduction may have cut back the combined population to about 500. Only in 1700 had the country recovered its pre-plague population levels of about 5 million – a figure which must seem astonishing to us today, accustomed as we are to a very crowded island. It is highly likely that there is a mass grave to be found in Wolverton and there may be two – one at Old Wolverton and another at Stony Stratford.